I am of the opinion that a dinner at The Restaurant at Drakes is a romantic affair regardless of whether you are going there with the express purpose of writing a review or if you are more focussed on staring into the eyes of your beloved and whispering sweet nothings. There is something about the venue and the staff that I really enjoy. I think they have made great use of the space which is big enough for privacy at your table but small enough that you don’t feel lost in a crowd. The lighting is soft and the music gentle. To take the pressure of your evening the staff can always talk about the food and Eddie – assistant manager and sommelier – will happily and expertly assist you in choosing the right wine for your selected food. So, last week, a very heavily pregnant me and my beloved set off for an evening of steak reviewing and romancing at The Restaurant at Drakes. Drakes (as it shall henceforth be referred to) is partnering with the Bluebell Vineyard Estates to bring us some of Sussex’ finest sparkling wine. And, it is a treat. I, obviously, didn’t have more than a sip of anything but the sip I had was delicious. It was the 2010 vintage that we were being served and it’s easy to see how this wine has gained so much recognition. Being no wine expert I shall resist the temptation to crib from the tasting notes on the Bluebell website and suggest that this is a grown-up glass of bubbles that is pandering to no audience. Drakes do this lovely thing where you get warm bread rolls – a choice of two different types – and then a two different butters. When we were there last week there was salted butter and seaweed butter. I found the seaweed butter very moreish. Strong in flavour but the taste of the sea made me think of summer and I had to fight a little to resist the urge to polish it all off. Luckily, my efforts were supported by the arrival of some appetisers – butternut squash soup in an espresso cup for me and Salmon Ballantine for Mr RB. My tiny soup was creamy and smooth, full of flavour, and piping hot. The Ballantine got polished off before I had a chance to ask questions so I take that as a very good sign. Mr RB opted for the Scottish langoustine starter which includes smoked haddock, crispy bantam egg, and lamb’s lettuce salad. I decided on the Chicken and wild mushroom ravioli which is served with a Madeira sauce. According to Eddie, the langoustine starter is a pairing “nightmare” but, as he likes to keep some of his wine off list Mr RB was treated to a glass of Yealands Estate Single Vineyard P.G.R. Aromatic Blend which is a blend of Pinot Gris, Riesling, and Gewurztraminer. I tried a mouthful of it was a really good glass of white. Dry, fruity, and a lot going on. The langoustine dish itself provided plenty of pleasure. The highlight was that the langoustine had absorbed some of the flavour from the smoked haddock which was great on top of the sweet succulence of the langoustine themselves. My chicken ravioli? Very good indeed. I love the flavours of wild mushrooms and I was very happy with my starter. Fillet of dry aged beef with truffle mashed potato, roast winter vegetables, and red wine sauce. We both had the steak. His rare, mine medium rare. 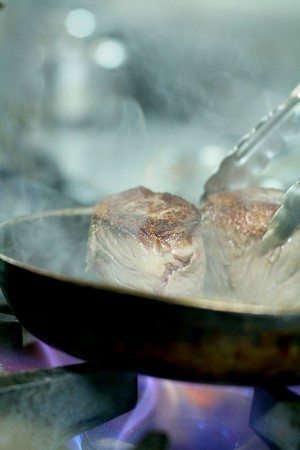 Mr RB invited himself into the kitchen to a)photograph and b)interrogate and came out with some good shots and the information that the beef comes from Dean Timpson. He then informed me that we probably need a water bath to which I responded that it was called a birthing pool. The confusion was soon cleared up when I realised he was still talking about how they cook the steak. A quick Google has revealed that domestic water bath cookers are indeed available but with our small but perfectly formed Hanover kitchen we operate a very strict one in one out policy on gadgets and I am not sure a water bath can justify its existence. I do a pretty good steak thanks to a great pan and Archer’s on Islingword Road so I’ll let the pros stick to the water baths. In my view, great steak is definitely a treat, always. Great steak with shavings of black truffle? And truffle mash? I really can do nothing but praise the great plate of food that was put in front of us. On its own the steak was beautifully cooked and packed with meaty flavour. Combined with the other elements of the dish, the smoothness of the mash, the earthy concentrated flavour of the truffle, the sweetness of the roast veg, the superb gravy – ahem, I mean red wine sauce – all adds up to be a star turn. To go with the steak Eddie chose a Chilean red – the Falernia Carménere which was a very full rich red, almost impossible to contemplate in summer, but perfect to accompany a steak on a cold winter’s night. We finished our meal by ordering an espresso and brandy for him and a fresh mint tea for me. The fun didn’t stop there though. We got treated to the desert appetiser – Rhubarb panna cotta with blood orange sorbet – which was another little jar of delight. 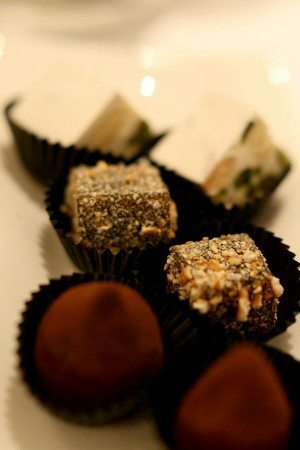 And then some homemade petit four: nougat, Guinness jelly, chocolate truffles. It’s up hill to Hanover from Drakes and I was beginning to get concerned that Mr RB would have to roll me back home. One last hidden gem was the brandy Tariquet Bas Armagnac. Mr RB was beside himself. Sounds like it’s worth a try.